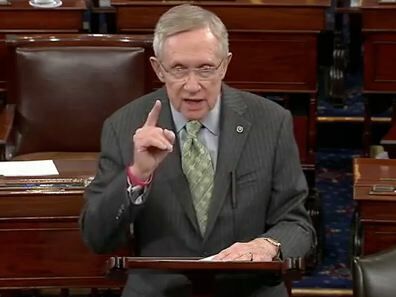 Reid: Gun Control "More Important Than Preventing Imagined Tyranny"
Sen. Harry Reid (D-Nevada) mocked Second Amendment rights activists while announcing his support for a ban on assault weapons and limits to high-capacity magazine clips on the Senate floor today. REID: In the 1920s, organized crime was committing murders with machine guns. So Congress dramatically limited the sale and transfer of machine guns. As a result, machine guns all but disappeared from the streets. We can and should take the same common-sense approach to safeguard Americans from modern weapons of war. That is why I will vote for Senator Dianne Feinstein’s assault weapons ban – because we must strike a better balance between the right to defend ourselves and the right of every child in America to grow up safe from gun violence. I will vote for the ban because maintaining law and order is more important than satisfying conspiracy theorists who believe in black helicopters and false flags. And I will vote for the ban because saving the lives of young police officers and innocent civilians is more important than preventing imagined tyranny. Krauthammer: Obama Using Newtown Families For Gun Control Is "Emotional Blackmail"